Marvel's monstrous success at the box office has become the stuff of legend, churning out hit after hit over the past seven years. Their winning streak is reminiscent of Pixar's lengthy stretch of hits, before they hit a rough patch with Cars 2. And some are wondering if Marvel will ever have a "slump" of their own, on the eve of their 12th film, Ant-Man. Is it a coincidence that Cars 2 was Pixar's 12 film as well? Is it a bad omen? Will the MCU finally fail to live up to exceedingly lofty expectations, or will its fascinating winning streak continue? While we'll have to wait and see how it does at the box office, from my standpoint, the winning streak certainly stands. Like Marvel has done time and time again, the studio has delivered a truly unique superhero experience with Ant-Man, introducing us to several terrific characters with a hero/heist hybrid tale that sets up Phase Three in clever and very unique ways, and has a ton of fun doing so. Even though it's the 12th MCU film, Ant-Man has been in development since 2006, the same year that Iron Man was first announced, and it has certainly seen more ups and downs than most, if not all, of the studio's projects. Edgar Wright and Joe Cornish were brought in to write the script, with Edgar Wright attached to direct for the better part of a decade, before his surprising departure, months before production was set to begin. Naturally, seeds of doubt started to spring up among the die hard fans, even after Peyton Reed came aboard to direct with Adam McKay and star Paul Rudd rewriting the script. However, the fact that Ant-Man is still another resounding, monumentally crowd-pleasing movie, proves that Marvel keeps finding a way to bring the goods, even in the face of unexpected adversity. When the studio quietly announced in October that Ant-Man shifted to becoming the last Phase Two movie, instead of the first Phase Three adventure, I was curious how this would fit into the MCU. I was pleasantly surprised to see how seamlessly they managed to integrate a new character into their existing universe, with an awesome surprise cameo, and two truly superb post-credit scenes that just may be the best they've ever done. One of the aspects of Marvel's work I'm impressed with is the way they manage to inhabit different genres (aside from superhero) with each of their films. Captain America: The Winter Soldier was inspired by 1970s political thrillers, Guardians of the Galaxy showed us their take on the outer space/cosmic adventure and Ant-Man, by and large, is a heist film. We have all of the common tropes of the genre, the hero/anti-hero seeking redemption/retribution, the wacky cast of supporting characters and an intricate plot that isn't overly complex, while giving fans all of the action and humor they have come to expect from the MCU. After a wonderful prologue, we meet Scott Lang (Paul Rudd), as he gets released from prison after serving a three-year stretch, where he's met by his longtime friend Luis (scene-stealer extraordinaire Michael Peña). After getting fired from the only job he could find, at a Baskin-Robbins, Scott gets drawn into a life of crime once again, along with Luis' friends Dave (T.I.) and Kurt (David Dastmalchian). Through an ingenious and comically-elaborate set of circumstances, this new "job" puts him in contact with Hank Pym (Michael Douglas), who tasks Scott with pulling off the heist of a lifetime, to steal back Pym's revolutionary technology that was taken/copied by his former protege, Darren Cross (Corey Stoll). To do so, Scott is required to become the Ant-Man, as he's trained, reluctantly, by Hank's daughter Hope (Evangeline Lilly). Hope makes a strong case for why she should be the one in this suit, which allows whoever wears it to shrink to the size of an ant, while gaining superhuman strength in the process, and allowing the user to communicate with ants themselves. Ant-Man is a heist movie on its surface, but at the core of this story is family, specifically fathers and daughters, and the things fathers will do to ensure no harm will come to their children. This trope has been played out in a number of different ways throughout the decades, but rarely with such authenticity than in this movie. We get all the snark and witty one-liners we've come to expect from Paul Rudd in his Scott Lang portrayal, but his desire to provide for and simply be there for his young daughter Cassie (Abby Ryder Fortson) is so heartfelt that it demands you cheer for his redemption. On the flip side, Hope is trying everything she can to connect with Hank, albeit in abrasive ways at times, and these two relationships provide a perfect duality. As wonderful as those aforementioned performances were, I was most excited about Michael Peña finally breaking into the big time with his fantastic performance as Luis, who provides just as much comic relief as Paul Rudd, if not more so. I've been a huge fan of his for years, and I hope a role like this, in a movie as big as this surely/hopefully will be, will finally give him the huge career push I've been waiting to see. One of the other things Marvel does so well, along with interspersing different film genres within their superhero stories, is mixing up the tone from one movie to the next. The studio went bigger than it's ever gone with May's Avengers: Age of Ultron, and Ant-Man offers a nice antithesis to that, in the same way that the studio gave us the ultra-light Guardians of the Galaxy just a few months after the serious action-thriller Captain America: The Winter Soldier. As a Marvel villain, Corey Stoll's Yellowjacket pales in comparison to Ultron, Thanos, Ronan and even The Winter Soldier, but he seems perfectly proportionate to what an introductory movie like Ant-Man needs. The stakes aren't nearly as big as Avengers: Age of Ultron, but that's not to say they're small either, and the balancing act in tones, genres, action, humor and everything else, both within each individual movie and throughout the entire MCU, is immeasurably impressive, especially given the immense about of proverbial plates that need to be spinning simultaneously to keep the whole operation running smoothly. Not only that, but they keep finding "unconventional" superhero directors like Peyton Reed, who does a terrific job at the helm with both the performances and several innovative action scenes, including a towering third act that is worth the price of admission alone. Would you have expected the guy who directed Bring It On to deliver magnificent action sequences? Would you have expected comedy writers like Adam McKay and star Paul Rudd to give us one of the most well-rounded stories we've seen in the MCU? On paper, probably not, but that just speaks to the brilliance of producer/MCU architect Kevin Feige, who sees something in these filmmakers that nobody else does, resulting in cinematic experiences that keep defying the odds and expectations, over and over and over again. Ant-Man is the just the latest Marvel movie you never knew you desperately needed, but once you see it, you won't be able to get enough of it. Ant-Man hits theaters on July 17, and be sure to stay tuned for my interviews with Michael Peña and T.I. as we get closer to the release. If you agree or disagree with my review, let your voice be heard below, or on Twitter @GallagherMW. 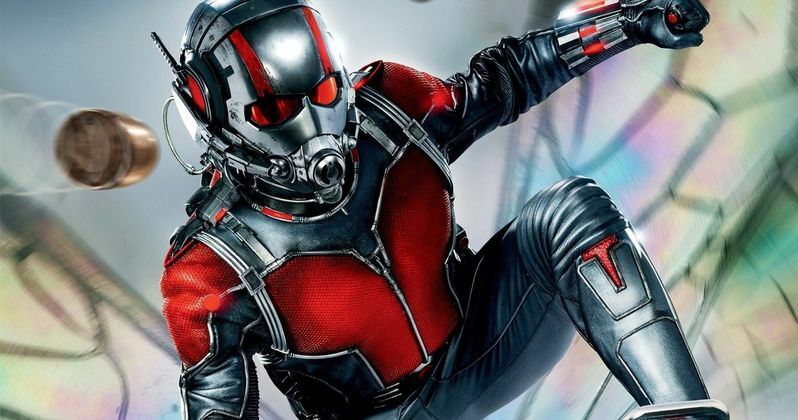 What do you think of Ant-Man after this review?